History: (What If? II#31) - After defeating the Tri-Sentinel at a power plant, Spider-Man pondered why the Uni-Power had not left him. He eventually figured that it was because he had a strong sense of responsibility and returned home to surprise his wife. Mary Jane was shocked to see her husband's pupil-less eyes and once he had explained what had happened to him, the two kissed. Days later, he singlehandedly defeated Nebula when he teamed up with the Avengers to halt her possession of a near-infinite energy source. Leaving the Avengers curious as to whether or not he had been corrupted by his power, Spider-Man later confronted the Hobgoblin while he was threatening to kill Joe Robertson. During the battle, Spider-Man figured that the Hobgoblin's real problem was that he was given demonic facial features and opted to solve the Hobgoblin's problem by using the Uni-Power to alter the Hobgoblin's face. Not being too familiar with molecular rearrangement and having never seen the Hobgoblin's true face, Spider-Man ended up altering the Hobgoblin's face so it resembled that of Peter Parker. Horrified, the Hobgoblin retreated, exclaiming that he would have his revenge. Following a party in Joe Robertson's honor, Mary Jane warned Peter that if tried to save the whole world, he might wind up losing himself but Peter replied that the Uni-Power was only enhancing his identity, not consuming it. Days later, Spider-Man accepted a challenge from Venom which Venom ended up losing due to his being flown into space by Spider-Man. As he left, Venom warned that when the symbiote has touched Peter, it found only a trace of the man it had once been connected to. Venom soon went into an alliance with the Hobgoblin. In the weeks that followed, Spider-Man's focus towards saving the world went global, as he halted an oil spill from the Roxxon/Velasquez, tossed accumulating garbage into the sun, and saved children from collapsing buildings, all while Mary Jane waited for him alone. Days after his "world tour," Peter and Mary Jane visited Peter's aunt May. While there, May asked why Peter was wearing sunglasses and when she removed them to check on his eyes, his spider-sense alerted him to an impending war in the Persian Gulf, prompting him to transform in front of May in order to stop the danger. Arriving as the war had just begun, Spider-Man managed to disarm both sides within hours and discovered that a Middle Eastern dictator was behind the crimes. Now calling himself only Captain Universe, Peter captured the dictator and returned home. Mary Jane soon began arguing with him about how irresponsible he had been by leaving his aunt in a hospital recovering from a nervous collapse that he had caused by transforming in front of her. Realizing that he had become someone she didn't know anymore, Mary Jane left Peter and went to her sister's house to stay. As Mary Jane sobbed to herself that it was over, Peter began thinking about how Mary Jane had called him a "god." Soon after, Peter busted into Avengers Mansion and grabbed Thor, claiming that he needed a god's power to save the world. Thor agreed to accompany Peter to Sudan where Peter explained that he would transport rich topsoil to replace the brittle soil while Thor would make it rain. Angry that Thor opted to let humanity find its own destiny, Peter punched Thor into space which soon Thor flying back to Earth in a rage. The two battled until "Doctor Doom" arrived and zapped Thor unconscious before Peter could further immobilize the Thunder God. 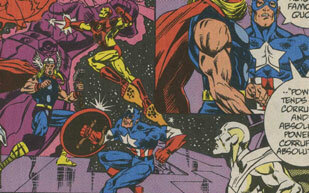 Peter attacked "Doom", angry that he had been set up, but "Doom" replied that he had brought a hostage and introduced Peter to Captain Ray Coffin, the first wielder of the Uni-Power. He then announced that he would spare Coffin's life if Peter relinquished the Uni-Power to him. Peter told him to stuff it and with that, "Doom" blasted Peter and broke Ray Coffin's neck. The guilt of an innocent man's life caused Peter to fall to the ground and generate astral forms of both Spider-Man and Captain Universe. 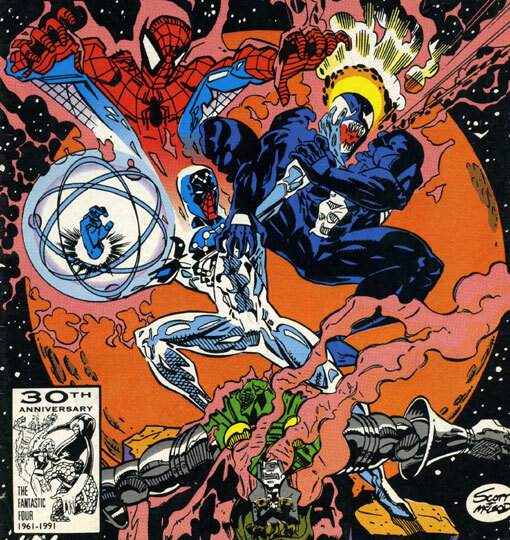 The Spider-Man form then battled the Captain Universe form with Universe claiming that the needs of the universe outweigh that of one man. The Spider-Man form then explained that the individuals that he would be giving up were the people that made him a hero in the first place. Spider-Man then gave up the Uni-Power which immediately found a new home in the form of "Doctor Doom." Almost immediately, the Uni-Power left "Doom," revealing him to be nothing but a Doombot that thought itself to be the real Doctor Doom. The power then returned to Peter, who destroyed the Doombot and then turned the Doombot's Absorba-Scan device on himself, freeing the Uni-Power which sacrificed itself for the good of humanity, touching everyone on Earth as it died. After the Uni-Power was gone, Thor helped Peter Parker to his feet where Peter noticed that his spider-powers were now gone, the Uni-Power having used them to catalyze its own self-destruction. Months later, after Peter and Mary Jane had fixed their relationship, Mary Jane gave birth to a baby girl with no pupils and a spider-sense. Comments: Created by Glenn Alan Herdling, Scott Alan McDaniel, Col. Sanders III (AKA Jim Sanders III), and Sam Delarosa. This reality diverged when the Uni-Power remained in the body of Peter Parker after Spider-Man had defeated the Tri-Sentinel. Given that Peter & MJ had a daughter, I chose to name her "May" like their daughter was named in numerous other realities. The Avengers were basically the same as their Earth-616 counterparts. 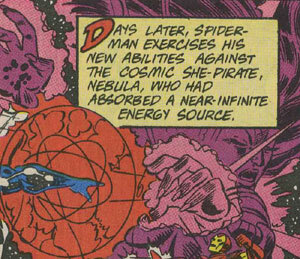 When Spider-Man aided them against Nebula, he made quick work of her using his Captain Universe abilities. After he left, the Avengers questioned whether or not he was going to be corrupted by the power. Weeks later, Spider-Man busted into Avengers Mansion and demanded help from Thor. Thor agreed but when he discovered that Spider-Man was trying to get Thor to help Sudan's hunger problems, he explained that the Asgardian Gods did not interfere with human destiny. An angry Spider-Man punched Thor, which sparked a battle that ended when a rogue Doombot blasted Thor unconscious. When Thor recovered, he found that Spider-Man had given up the Uni-Power and helped him to his feet. They were (from left to right): Thor, Iron Man, Captain America, and Vision. Peter Parker was the same as his Earth-616 counterpart up until the Uni-Power opted to remain in his body following the defeat of the Tri-Sentinel. As Captain Universe, Peter's responsibilities to the world grew and grew until he began to sacrifice his personal life for the needs of the universe. When Mary Jane left him, Peter dedicated himself to global crimes until a rogue Doombot killed Ray Coffin in front of him when Peter refused to relinquish the Uni-Power. 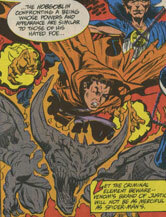 Coffin's death prompted an astral battle between Peter Parker and the Uni-Power which resulted in the Uni-Power sacrificing itself (and Peter's spider powers) for the good of mankind. Months after he had made up with Mary Jane, Peter fathered a baby girl that appeared to have both the Uni-Power and Peter's old spider abilities. As Captain Universe, Peter had superhuman strength, flight, durability, uni-vision (x-ray and cosmic energy blasts), the ability to rearrange molecular matter, and retained his spider-sense and agility that he had as Spider-Man. Once the Uni-Power left him for good, Peter possessed no superhuman powers whatsoever, the Uni-Power having taken away his spider powers to catalyze its own sacrifice. Like his Earth-616 counterpart, Ray Coffin was an early recipient of the Uni-Power. When Spider-Man became the Uni-Power's new host, a rogue Doombot began researching how to gain the power for itself. Taking Ray hostage, it tried to force Peter to relinquish his Uni-Power by threatening to kill Ray. When Spider-Man refused, the Doombot broke Ray's neck. Daredevil was the same as his Earth-616 counterpart. 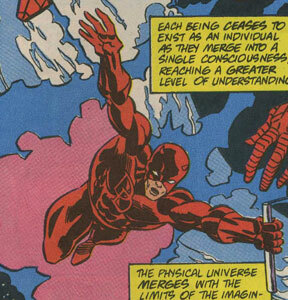 When the Uni-Power sacrificed itself, it touched everyone on Earth, including Daredevil. He presumably had the same superhuman senses and radar sense that his Earth-616 counterpart had. Hobgoblin was the same as his Earth-616 counterpart up until he threatened Joe Robertson and was confronted by the Uni-Power-wielding Spider-Man. Thinking that Hobgoblin's problem was that his deal with a demon had left him with demonic facial features, Spider-Man opted to fix things using his molecular rearrangement powers. Not having any other mold to go by, Spider-Man altered the Hobgoblin's face into that of Peter Parker. Demanding revenge, the Hobgoblin eventually went into an alliance with Venom. The Hobgoblin had superhuman strength, like his Earth-616 counterpart. Nebula was the same as her Earth-616 counterpart up until she battled the Avengers and Spider-Man. She was defeated quickly by Spider-Man alone due to his Uni-Power abilities. May Parker was exactly like her Earth-616 counterpart up until she removed Peter Parker's sunglasses, exposing his pupil-less eyes. Almost immediately after she did so, Peter's spider-sense warned him of an impending war in the Persian Gulf and he transformed into Captain Universe right in front of May, causing him to suffer a nervous collapse. She was hospitalized due to the collapse. "May Parker" was the daughter of Peter and Mary Jane Parker. She was born with no visible pupils. 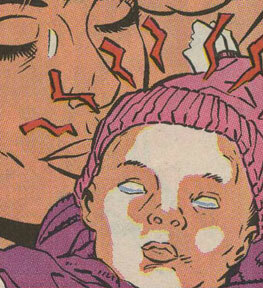 She appeared to possess latent Uni-Power and had Peter's old spider-sense ability at birth. Joe Robertson was no different than his Earth-616 counterpart. When the Hobgoblin threatened his life, Spider-Man defeated him. After Joe was saved, a party was thrown in his honor. Eddie Brock was very similar to his Earth-616 counterpart. 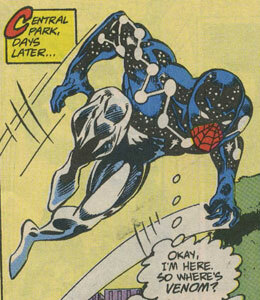 When he challenged Spider-Man, he was taken into outer space where he surrendered due to Spider-Man's cosmic abilities. As he left, he warned that his symbiote had touched Peter and found almost nothing of the man it had once been connected to. Venom later went into an alliance with the Hobgoblin. Venom wore an alien symbiote that gave him all of the powers that his Earth-616 counterpart had, including superhuman strength, organic webbing, and the ability to neutralize Spider-Man's spider-sense. Mary Jane was the same as her Earth-616 counterpart up until Peter Parker's responsibilities as Captain Universe prompted her to leave him. The two eventually made up after the Uni-Power sacrificed itself and the two had a child together, which had no pupils and appeared to show some of Peter's spider abilities such as a spider-sense.